The Aspen Pet Pet Porter features safety, comfort, and style all in one. This pet porter offers a quick-latching system for your pet’s safety and comfort. 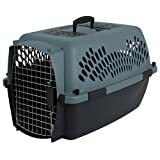 Pet Porters in sizes 19″, 23″, 24″ and 26″ offer built-in compartment covers for added storage of treats or other pet needs. Side vents promote a healthy air flow. The stylish design has a great appearance and allows pet parents choose from an assortment of sizes and color options to fit your pet’s lifestyle. Made in the USA. Meets most airlines requirements.